LINE PRESSURE GAUGE 1.5" NH (38mm) Pitot-type, liquid-filled 0-200 psi (0-14 bar) gauge is ideal for testing and training purposes. Gauge has protective ring to resist damage. Swivel inlet coupling. 1.5" NH (38mm) thread is standard. 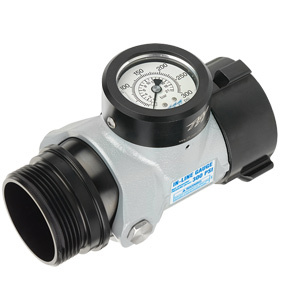 LINE PRESSURE GAUGE 1.5" NH (38mm) Pitot-type, liquid-filled 0-300 psi (0-21 bar) gauge is ideal for testing and training purposes. Gauge has protective ring to resist damage. Swivel inlet coupling. 1.5" NH (38mm) thread is standard. IN-LINE PITOT PRESSURE GAUGE 2.5" NH (65mm) Liquid-filled 0-200 psi (0-14 bar) gauge designed for use on standpipes, truck outlets, on the ground, or where having a pressure reading is advantageous. System includes a protective ring and lens cover for the pressure gauge. Swivel inlet coupling. 2.5" NH (65mm) thread is standard. IN-LINE PITOT PRESSURE GAUGE 2.5" NH (65mm) Same as J25G200F above with liquid-filled 0-300 psi (0-21 bar) gauge. IN-LINE PITOT PRESSURE GAUGE 2.5" NH (65mm) Liquid-filled 0-200 psi (0-14 bar) gauge designed for use on standpipes, truck outlets, on the ground, or where having a pressure reading is advantageous. 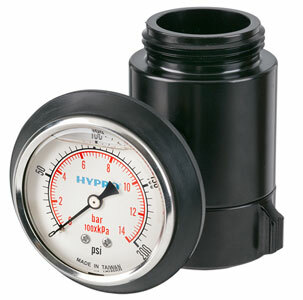 System includes a protective ring and lens cover for the pressure gauge. Swivel inlet coupling and +/- 20° pivoting outlet. 2.5" NH (65mm) thread is standard. IN-LINE PITOT PRESSURE GAUGE 2.5" NH (65mm) Same as J25G200S above with liquid-filled 0-300 psi (0-21 bar) gauge.